Starslip by Kris Straub » Tweet Me Harder LIVE in Seattle, WA! 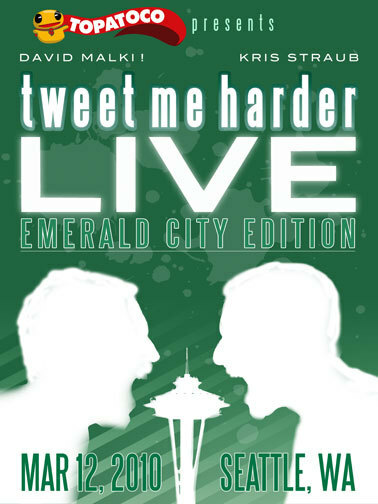 Tweet Me Harder LIVE in Seattle, WA! TopatoCo Presents: TMH LIVE in Seattle, WA – March 12! We’re very pleased to bring TMH Live to the TopatoCo Emerald City Comicon Kickoff Party, hosted at Arcane Comics & More in West Seattle, WA! TopatoCo (the fun-things-publisher that produces merchandise for both Kris and David’s comic strips) is bringing tons of its popular cartoonists to the Emerald City Comicon the weekend of March 13 & 14, and the night before, they’re throwing a fantabulous pre-party for all to come and enjoy! Admission is free! IN SUMMARY – cool party, meet some cartoonists, listen to a live comedy show and go home happy! What could be better??? Though the comic store is open all day, our folks will start getting there around 6PM and TMH LIVE will start at 7PM. The address is: 3219 California Ave SW, Seattle WA 98116. We’ll be hanging out afterwards for a meet-&-greet as well. See you there on Friday, March 12! P.S. You can also RSVP and tell your friends on FACEBOOK!